Discussion in 'Motors' started by shauncr91, Dec 19, 2018. Car transporter driver here. I do a 4 on 4 of shift. Basic is 33k plus overtime plus night out money. Should clear 45k this year. Been doing for two years. It’s hard graft but the money and time of is great. Can’t work our image. But I drive a 2016 Scania. With not many gadgets but has a built in fridge which is great. The bed is the worst out there for this type of truck but the best to drive. So I drive mainly 42tn volumetric concrete motors, 32tn tippers and a rigid low loader for a waste management and building company. Money is decent, earn about 5-600 a week doing 55-60ish hours. Work alternate 5/6 days a week. Lots of graft though. What kind of personal qualities would you need for a truck driver. Your dealing with massive machinery for example, a lot of responsibility, I'm trying to work out whether I'm cut out for the task. Strong initiative with the ability to work independantly for long periods of time. Safety is number one at all times. A calm head that doesn't explode when things don't go your way while having a firm attitude towards people when needed (If you allow it then people will take the ****, from slow unloading to stupid requests to other road users). Some firms will ask you to take out equipment or loads which aren't safe/legal, don't be scared to tell your boss no. Believe it or not you do have to be smart to do this job, there's a lot of thought has to go into working out loading, weight, measurements, planning, problem solving. You can get by as a lorry driver while being a knuckle dragger but to do the job well you need to be above that. It's a tough and sometimes dirty job, being a driver is only half of the job and depending on what line of work you get into you could be rolling around in the mud under machinery or sat with your feet up drinking tea. You'll develop a lot of the qualities needed over time and soon realise it's not like a lot of other jobs or just driving up and down your county 9-5. I went from working in a call centre to this job and initially hated it thinking I'd made a mistake but I stuck at it for a year and now haven't looked back. You do know you can pull the little tag sticking out underneath the bunk that lets the bed slide forward (once you have moved the seats forward) which gives a much better bed, to my shame, I ran an 08 plate R420 for three years without realising this and always thought the bunk was cack! Its not a job, its a way of life. Once you learn to let Mr Knobjockey in his 530d cut you up etc etc its actually a very easy game to play, your paid by the hour to run around in something the vast vast vast majority of UK license holders would'nt know where to start with going forwards, never mind in reverse..
Golden rule is chill,your paid by the hour, delays = more money and thats pretty much all there is to it! So I’ll post up a bit about what I do as a car transporter driver. So I started 2 years ago with a small company my brother was working for at the time. I was put in what we call an 11plus. So it would hold 11 cars but it could take 12. I passed my test in 2000 but never really used and for artic driving I had zero exsperiance but i new what my brother was earning so went for it. Now I had a weeks training on loading and unloading the cars and believe me it’s not as easy as it looks, it takes some decent driving skill and some balls as you are working at height. There was a few times I wanted to jack it in as my brain was fried as each load was different and had to be loaded in such a way so 1 they would fit on the truck and 2 they would be under 16foot. Not always an easy ask. But I perservered I now work a 4-4 shift, in a decent truck running a rolfo trailer. Now what everyone asks about is money, I take a basic of 33k a year plus bonus plus night out money, I get my night out money weekly and the worst pay statement I have had so far is 2400 and that because I damaged a car and lost a weeks bonus. On the other hand my brother works for the leading transport company but mon-fri and his weekly take home is about £800, so yes there is still good money in driving. Would I recommend car transporting? Yes but you have to want to do it, most guys come over from a cushy life moving containers but want to earn big bucks don’t normally last 2 weeks as it is serious graft and they either can’t do it or can’t be bothered to do it. The winters are hard, wet cold and windy. You are also living in a tiny cab. Not in luxury like Scania is in. There is more of a community as well as we will always help another driver regardless of who he works for, in this job nobody knows everything. There are so many variable. One of my workmates drove for Beamish and he said it was one of the the hardest jobs he'd done in transport, very involved and complex as you say. It's probably good to like Solitary Confinement too ! When you arrive at a destination point work out a "battle plan" on how you are going to deliver. Look for paint rubs & broken indicator glass etc on the floor and figure out how they "twatted" something. *This old codger actually reported me for DANGEROUS DRIVING !! 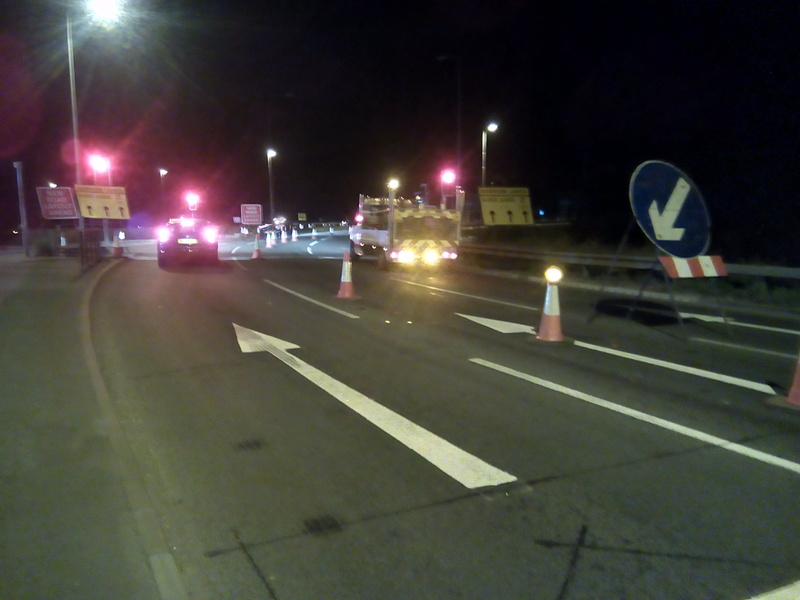 On the night of the incident I entered the roundabout above Junction 24 of the M1 from the A50 eastbound intending to continue into Kegworth. As I approached the roundabout it was clear that the two inside lanes, One for the M1 Southbound and the other the A6 for Kegworth were coned off and I proceeded into the only available lane, the A453 and waited at the red traffic lights behind a car already there. My cab was deep into the coned off area and there was NO traffic at that time waiting to filter in. As the lights changed and I proceeded to move off I glanced in my offside mirror and noticed someone had stopped with the bonnet of their vehicle (EY58 ***) practically under the side guards of my trailer. I stopped immediately having probably only attained 2mph at most but the downward dipping motion of braking rubbed against his nearside wing. I opened the window and asked why he did what he had done and he indignantly proclaimed he “was in the lane for Kegworth, I’m from Kegworth and know what lane I should be in”. I answered saying something like ”The lanes are coned off you idiot, The lane I’m in is the only one available” to which he re-stated that he was from the village and knew what lane to be in ! I was annoyed that I now had to lose half hour swapping details and and would have to fill in an accident report when I returned to the depot (another half hour lost) plus the ridicule I would get from other drivers that the S.A.F.E.D Instructor (me) had been involved in a collision ! S.A.F.E.D is an acronym meaning SAFE and Fuel Efficient Driving ! I told him (Mr N) that I would pull into the approach to Kegworth and would swap details with him. I drove off expecting him to follow behind (Where he should have been in the first place) but to my utter disbelief he had driven inside the cones recklessly endangering the possible roadworkers by driving next to my cab inside the work area. After stopping on the Kegworth road I walked to the rear of my vehicle and told Mr N “You’re not an idiot, You’re a complete utter Moron” ! (Due to him driving inside the coned off work area) to which he once again replied that he knew what lane he should be in ! It was at this point I realised that I really ought to take photos and walked back to the scene. A “Highways worker” had then turned up and was re-aligning the cones back where they were before Mr N had knocked them out of the way and asked why I was taking photos. I told him why and he said he didn’t blame me as , “he’ll try and get out of it” ! The driving actions of Mr N make me wonder if this is actually “Crash for Cash” such is its ridiculousness ! I received a reply from Leicestershire Police saying they have reviewed it and will "let me off" on this occasion but it's "on record" !! Starting on doing some nights out for the first time next week. I feel like I've got most bases covered in terms of equipment but what would people suggest that I could find myself needing and possibly have missed? Freezer box, inverter, microwave oven, plenty of thick blankets (sods law the night heater will fail on a freezing night!) 24v kettle (always run the engine when using it) cup a soups and pot noodles for times when your stuck in a lay-by Miles from no food etc. Spare change of clothes, first aid kit,wet wipes,laptop loaded with films and a few good books. Spent 5 years tramping for Stobart, I had all the above and didn’t worry where I parked because I had the basics to get by until morning. Ultimately you’ll survive the night with nothing bar warm clothing and water - always carry a few bottles of water - everything else is a nice extra. If you use a camping Gaz burner then before you light it open both windows a little way. You can shut them when it's lit. A work colleague didn't do this and blew all the windows out ! I remember being parked at Lockerbie truck stop a few years back and woken by a huge bang, the driver next to me had woken up and lit a cigarette but not realised his gas canister had been leaking, blew him out of the windscreen and he was sat dazed on the floor looking straight out of a cartoon, black face and hair standing on end, it was hilarious (not for him!) but could have been much worse. Stobarts ban gas cookers in cabs for this reason. Is anyone out there still driving a manual lorry. Most of the vehicles in my depot are manual, I get the feeling we're a bit behind the curve. Most of our rigids are manual but all the artics are automatic. Our training tractor unit used to be a manual so drivers could drive one should they ever need to, but not anymore. Driving a truck really shows you how many idiots are on the roads. It was tough at first as i had a mind set of "you ain't getting in front of me" but i now just let drivers do stupid stuff and hang back, they will get their comeuppance one day. with all the safe and efficient driving we are now trained to do and the impatience of the every day driver it is amazing what some people will do to pull off a risky overtake in order to save what in the end is only a few seconds! I don't drive them but all the ones where I work are automatic now - the new Mercedes, etc. units are ridiculous in terms of the electronics onboard now (I've seen high end luxury cars with lesser spec). Seems to be harder and harder to get drivers these days though a lot of the younger generation don't want to do it and the pay in many cases in decline isn't helping - before my time but where I work someone who was prepared to put the effort and hours, etc. in could clear 60K a year back in the day - these days they'd be lucky to get out the 30s and while I don't know for sure I think a lot are on less than that now - with the result that a lot of the older drivers have gone on long term sick and other stunts for as long as they can then retired. Well, tucked up for my first night out, loaded out of Birmingham for Carlisle but delays on the M6 meant it wasn't going to happen today so tucked up in Lancaster North services. Be mindful that you can get prosecuted for drink driving if your found to be in the vehicle over the limit, I know a few drivers who’ve been caught out by this - even though they are parked for the night as per the law and legally can’t drive the vehicle! If you do have a beer or two on a night out, do not answer a knock on your cab door! I imagine he's in the Travelodge.